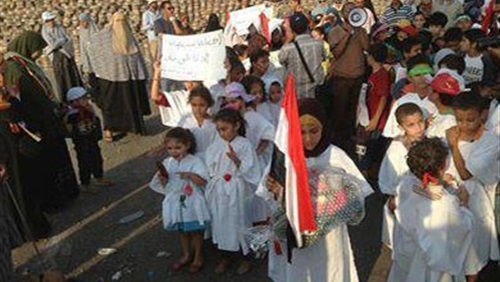 On the 30th of July 2013 the following video shows Children and Women in Rabaa Square Nasr City – Cairo, Brotherhood leaders of the demonstrations in Rabaa Square, forcing children to wear shrouds and placing kids and women in the front rows. In the following video, the brotherhood leader of demonstration is telling women, You women are going to be in the first rows and once we reach the target, you start pushing in order for us to break in. Then, women did as they were told once they reached their target which is the military soldiers protecting ministry of defense, they did as they were told “pushing” so men can manage to break in. The whole idea is that they put women in the first rows to start clashes with military, then they claim that the military is attacking women and then use it in the international fake medias. Then watch the kids in the videos, they are forcing them to chant that they are martyrs for Mohammed Morsi and they also forcing them to wear shrouds. What those kids really know about politics or even Mohammed Morsi?! what do kids know about martyrs! Muslim Brotherhood announced that those kids are “Martyrs Project”. They are willing to die for Mohammed Morsi!!! In Rabaa Mb are telling kids, do you want to kill the Egyptian Minister of Defense? the kids said yes. The MB said how are you going to kill him, you don’t have any weapons? the kids said we are going to kill him with our own hands. That’s what they are teaching kids in Rabaa square! Brotherhood are not only religion traders, but also children traders! 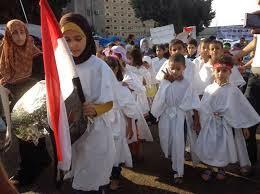 children and women care and rights organizations in Egypt Dr. Hany Hilal, announced that the kids who are used in Rabaa square by the Muslim Brotherhood, some of them are kids of the demonstrators, and the majority of the kids are street kids and Orphanage kids. They confirmed that they have discovered that children trading committed by the brotherhood and they have already made an official statement in the General Attorney’s Office. Are there any children or human rights out there who really care for those helpless kids? Of course not, now the world is playing deaf and dead because the international medias is busy with other stuff that only serve Muslim Brotherhood spreading lies and fake news! Conference held the 2nd of August 2013 announcing Brotherhood violations to kids and women rights. I wonder where all those fake human rights organizations form using children in armed demonstrations and sending them in clashes and confrontations with Military and police who are guarding vital official buildings like the ministry of defense? Where are you guys? Where are the international medias? The Muslim Brotherhood who threw kids from the roof top in Alexandria City (Just like the Hamas Style) are the same ones who are sending kids and women to be killed in their armed demonstrations. The killers of Children who got arrested in the case of throwing kids from the roof top, confessed that they are Brotherhood Militia and they do not regret what they have done to those kids. The killers who threw those kids, did not only do this but after they were thrown, they got tortured as it show in the following videos. What kind of savages and terrorists, the world is supporting here? Animals don’t kill or attack their kids, but Muslim Brotherhood do kill kids and torture them! Those are the savages the world is supporting and pushing our government to release them from jails and they are even asking for their safe exit! I wonder why?! The following video is the only boy who survived from the massacre of throwing kids from the roof. He said that Brotherhood Militia went up to the roof while him and the other kids got scared and managed to go on the top roof with a ladder, so the Brotherhood don’t attack them. But the brotherhood used the same ladder and reached those kids. The boy got scared and went down on the ladder trying to escape from the roof, He saw Brotherhood carrying guns, swords and knives. One of the brotherhood stabbed him with a knife, but he managed to escape from him and he ran with all his energy, brotherhoods ran after him, but he managed slip on the water pipes till he reached the ground floor and got rescued. The brotherhood claimed that this incident of throwing kids from the top roof is fake. Of course it is fake, and so is the 4 bodies of the kids who got thrown and killed and so is the killers who got arrested and confessed and even do not regret their massacres.